The most recent photo of CR 21114 at Marion, OH on May 1, 1999. CR 21118 at Brunner Island Power Plant, York Haven, PA.
Photo by T.W.Wolfgang (50k) CR 21114 in the Marion yards, mid April '97. See the photo below to see how it looked shortly after Conrail took over the EL. CR 21114 at Fairview Barbertin, WV. Still has original trucks and roofwalk. From the collection of Roger Kirkpatrick (59k) CR N-7D 21110 as ERIE C340. Be sure to visit The Rail Station, Jeff's web site. 47 cars 21100-21146 ex EL/ERIE C-300 to C-347. Bay window type, large bays, riveted. C-300 built by the Erie as a prototype at Dunmore in June 1952, remainder built by International in 1953. 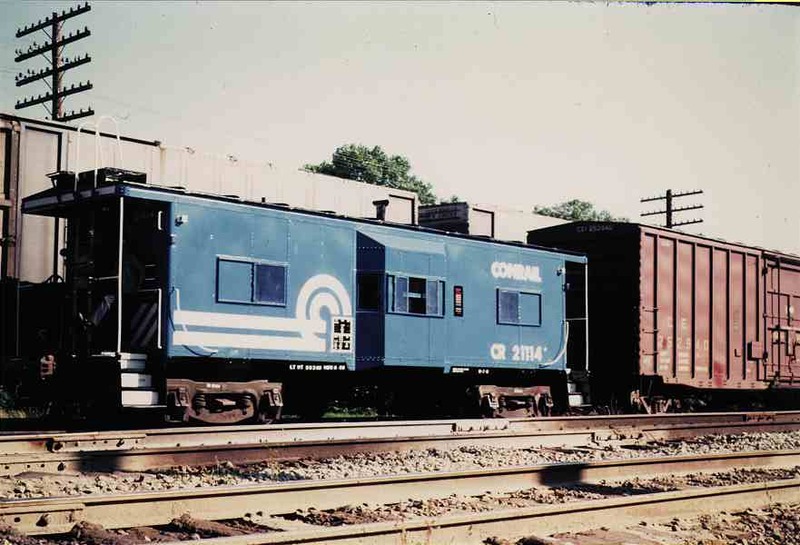 When built these cars rode on what looked like express reefer trucks, Conrail later replaced them with standard swing-motion types. 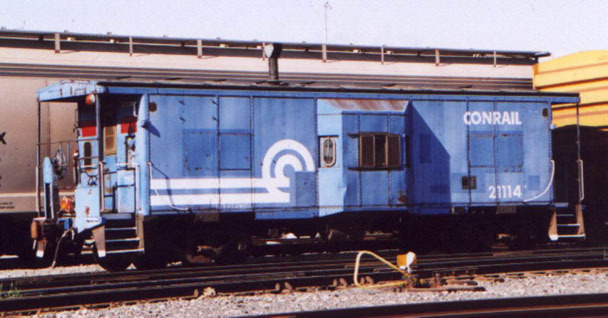 At least three of these cars, 21108-21110, were painted with the "wheel" part of the logo on the right side of the bay instead of the left as on most bay window cabs. Created from a drawing on George Elwood's EL site and photos by T.W.Wolfgang. Can be kitbashed based on Athearn or Walthers bay window caboose, new sides and ends must be fabricated. 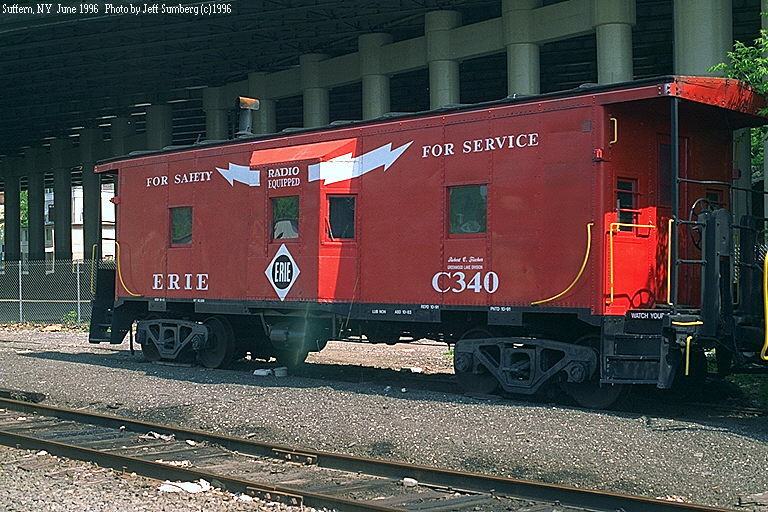 The original trucks on these cars came from Erie milk cars and would be a nice detail, at least one car was repainted blue with the old trucks still underneath. Anyone know of a source for this type of truck? 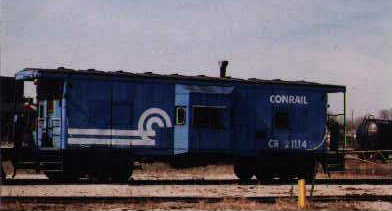 American Models has this ex-Erie bay window caboose decorated for Conrail. Lionel produces a 'toyish' version. Currently available as EL C-301. George Elwood has created this drawing using Corel Draw and Cadkey based on a scan of a drawing owned by Dan Biernacki. Larry Berger had the drawing scanned to create a TIF file that George used as a reference. Both GIF and DXF formats are available on his EL caboose page. Be sure and check out the rest of his work, a great resource for the EL or transition era modeler.